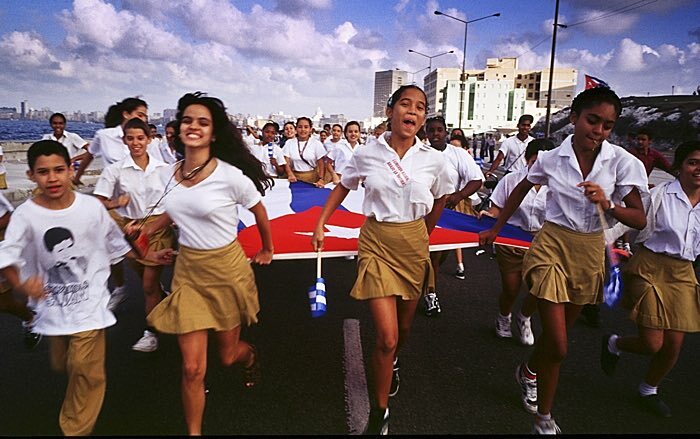 Students carry the Cuban flag down the Malecon in Havana. I made this photo during a trip to Havana in February 2000. Big news this week out of Washington and Havana. President Obama announced that the US would reopen its embassy in Havana and start the process of normalizing relations with Cuba, which lies less than 100 miles from Florida. I worked in Cuba several times in the early 2000s. I went legally, through workshops arranged by the Maine Photographic Workshops (now Maine Media Workshops). I didn't work on specific stories, instead I wandered the streets and traveled across the western end of the island, going as far east as Trinidad. Women in a home for pregnant women in Trinidad. The Cuban government provides basic health care for its citizens. I was struck at the warmth and hospitality of the Cuban people. I was walking down a street in Havana and heard music coming out of a home. I looked in the window, and a woman came out to greet me. She dragged me into the house where there was a party going on and an older woman was teaching younger people how to salsa dance. Americans used to be something of a novelty in Cuba and the Cubans I encountered were eager to dispel misconceptions Americans might have about their island nation. 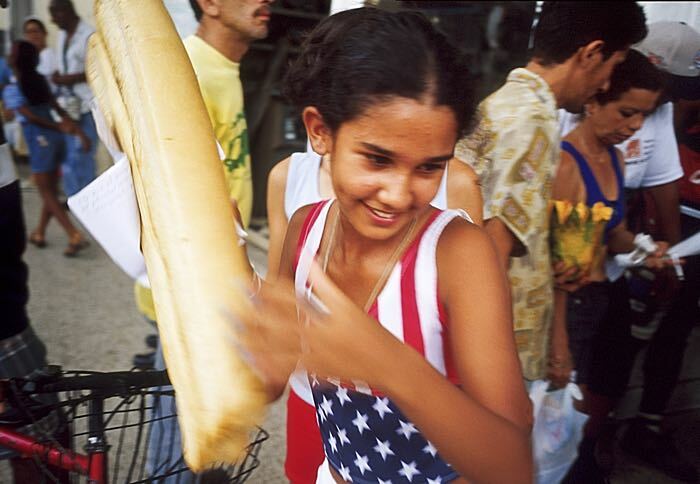 A young woman wearing an American flag tee shirt leaves a bakery with a loaf of bread. Normalizing relations will likely lead to the end of the embargo and dropping travel restrictions to the island. Americans will no longer be a novelty in Cuba. I'm glad I was able to see Cuba when I did. The coming invasion of gringo tourists will probably change the island nation as much as Fidel and his comrades in the 26th of July Movement did. Cuba was one of the last times I used film in any significant way. Most of what I did there was photographed using Fujichrome Velvia, for the night, indoor and low light stuff I used Fujichrome Provia 400. My cameras at the time were Canon EOS film bodies and the Contax G2, a lovely small rangefinder like camera.